Rated R for language and some horror violence. The original "Paranormal Activity" was an ultra-cheap spook show that managed to attract huge audiences that were lured in by its low-fi aesthetic, and the central gimmick of being presented as a collection of home videos made by an ordinary couple hoping to capture evidence of a supernatural entity. Of course, the problem with making a film based around a gimmick is that it only really works that first time and if a follow-up is in the cards, and the astronomical grosses made that all but inevitable, the filmmakers would have to do one of two things—either offer viewers something new and different and risk alienating them (as was the case with "Book of Shadows," the reasonably ambitious, though deeply flawed continuation of "The Blair Witch Project") or just give them the same thing with only minor variations to the formula for as long as they are willing to pay to see them. In a move even less surprising than anything on display in the films themselves, the people behind the "PA" films chose the second path, and over the next few years, they essentially gave viewers the same ghostly claptrap over and over with only a couple of minor tweaks to the formula that have so far included a straightforward (sort-of) sequel, a retro-themed prequel set in the '80s, a version centering on hip teenagers with their smartphones and their complicated pants and a spinoff aimed at Hispanic audiences. Now comes the latest installment, "Paranormal Activity: The Ghost Dimension," and the sixth time is not the charm with this load of hooey that tries to make up for its lack of legitimate scares or basic narrative clarity by adding the alleged miracle of 3-D into the mix. Our potential victims this time around are the Fleeges—dad Ryan (Chris J. Murray), mom Emily (Brit Shaw), their adorable moppet Leila (Ivy George)—who have just moved into a new home so vast and expansive that the late Aaron Spelling might have deemed it to be a little ostentatious, though the extra space does allow for the presence of his doofus brother Mike (Dan Gill) and her New-Age sister Skyler (Olivia Taylor Dudley). One day, Mike stumbles across a box containing a bunch of video tapes and an ancient video camera approximately the size of a Buick. Naturally, Ryan is ridiculously fascinated with the camera (so much so that he never seems to have to go to work or anything), especially once he discovers that it has been custom-built to allow people to see weird apparitions. Cue the usual array of strange noises and things popping up in front of the camera as the demon known as Toby takes up residence in the house, and tries to lure Leila to his side as part of its diabolical plan to assume human form and take over the world. The whole enterprise is, of course, irredeemably idiotic in every possible way. Even by the standards of the genre, the characters here are moronic beyond belief—they have a number of cameras strewn around the house to capture all of the nocturnal activities but evidently never bother to watch any of the footage and seem oddly insistent on leaving Leila to sleep alone long after it has been established that some supernatural deity is pursuing her. The screenplay is so lazy in its construction that exposition is covered in rushed bits of dialogue that come out of nowhere ("What if the witches are using them in some sort of ritual to give Toby a human body?") and there are actually several scenes that consist entirely of the characters watching footage from the earlier entries in the series in a gambit that reminded me of one of the more inspired jokes from "Spaceballs." The scare scenes are the same as in all the previous films—long static scenes of empty rooms that are eventually punctuated by something jumping in front of or getting yanked away from the camera. As for the finale, it is so weak that even those that have actually liked the series will be annoyed with the weak sauce conclusion on display, especially in the way that it utterly fails to deal with a certain character who was of great importance in the other films but who is almost completely overlooked here. Then there is what must be one of the sorriest deployments of the dubious miracle of 3-D that I can readily recall. Remember that camera that shows the weird apparitions? Well, whenever we are supposedly seeing things from the perspective of that contraption, the image goes into 3-D as ectoplasmic entrails and other random items are hurled before the camera. First of all, the format is never used here as anything other than a tired gimmick that adds nothing to the story but three extra bucks to the ticket price. A bigger problem is that the presentation is scary only on aesthetic grounds—between the natural murkiness inherent with the process, the attempt to recreate the sometimes smeary look of early-90s VHS technology, and the fact that all of these sequences take place at night with minimum lighting at best, there are long stretches of time when the onscreen results are almost literally unwatchable. 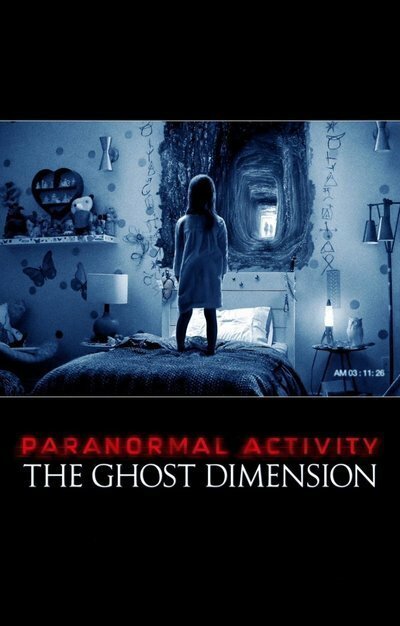 There is actually a second gimmick at play in "Paranormal Activity: The Ghost Dimension" in addition to the 3-D that will be familiar to most seasoned genre buffs. Perhaps sensing a waning in the appeal of the series over the last couple of installments, the producers are insisting that this is going to be the absolute, honest-to-goodness finale to the series and that wild horses could not convince them to do another one in the future. Considering the lack of any real resolution, especially in regards to that one character I hinted at earlier, my guess is that if this does well enough at the box office, that promise will fall away as quickly as it did when the producers of the "Friday the 13th" and "Nightmare on Elm St." franchises made similar claims back in the day. If a new one does come along in due time, the producers will need a new addition to the formula in order to differentiate it from its predecessors. I say make the next one a musical—that alone should make it scarier than the other films in total.